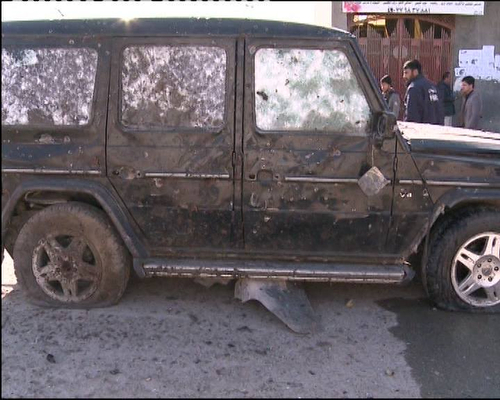 The attacker carrying bombs on his body jumped out of a roadside ditch and ran into the motorcade of Balkh province’s deputy governor before detonating the explosives. The deputy governor, Mohammad Zahir Wahdat, survived unhurt in his armoured vehicle but two of his bodyguards were wounded, provincial police chief Abdul Rahman Rahimi told AFP. A civilian passer-by was killed and two other civilians were wounded, the police chief said. Über die Zahl der Opfer gibt es noch keine endgültige Klarheit, nach Angaben der afghanischen Internet-Nachrichtenseite Khaama Press wurden zwei Menschen getötet und vier verletzt.